LEADPrep is a progressive “micro-school.” What exactly is a “micro-school” and what does that mean for our students? But really, there is no common definition that covers all these schools, which vary not only by size and cost but also in their education philosophies and operating models. Matt Candler, founder of 4.0 Schools, writes, “What makes a modern micro-school different from a 19th century, one-room schoolhouse is that old school schools only had a few ways to teach — certainly no software, no tutors, and probably less structure around student to student learning. Why are micro-schools popping up all over the US and Europe? Micro-schools are attractive to families who are dissatisfied with the quality of public schooling and cannot afford or do not want to pay for a traditional private-school education. Homeschooling has been an option for families to personalize instruction for their children’s needs. Homeschool families often create cooperatives to gain flexibility for the parents and socialization for the children. Often much less expensive and inflexible than private schools, yet more formal than homeschooling, micro-schools innovate to meet the needs of individual students within a community of learners. 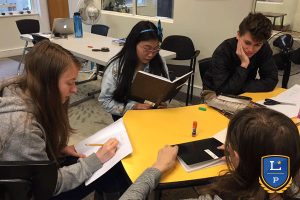 That’s LEADPrep…a micro-school for adolescents in the greater Seattle area!